Having driven couple of stick shift cars for 14 years, I decided to get a new Compact Crossover – a 2012 Honda CR-V EX-L AWD w/ Nav. Having read so many discussions and the negative propaganda on SUVs I felt that I was making a mistake. After buying the CR-V and driving it around, I knew I had made the right choice and a practical one that. All this criticism about SUVs and Crossovers is done by folks that don’t own or haven’t really driven them around. My wife has a V6 Toyota RAV4 and I always loved driving it so much that I had to get myself another compact crossover. So why do I think it makes sense in the Bay Area? This is my primary reason. In the Bay Area where there are so many SUVs on the road and with drivers slamming their brakes all the time, sitting in a car just didn’t give me a sense of the traffic a few cars ahead. As a defensive and cautious driver, you’ve got to have a feel of the traffic ahead, otherwise the car in front of you is going to slam his brakes without your anticipation. In an SUV, you are sitting higher and so can gauge what’s out there and anticipate that ‘Stop and Go’. I am never buying a stick shift car/SUV again at least in the Bay Area and not if it will be my only vehicle. It really becomes so stressful driving, especially with the Stop and Go traffic, accidents, packed freeways and the traffic lights that seem to always go Red on you. For me, all this stress was simply gone! I don’t think about it anymore. The show-offs that want the manual transmissions can buy them, but the fact of the matter is in the Bay Area where there are like 95% automatics people will drive like they’re in automatics. PERIOD. You have to keep shifting and keep cursing which is just unnecessary stress. I loved driving stick shifts, but on weekends. The 2012 Honda CR-V does not even have a manual transmission option. Personally, it doesn’t matter to me whether its a 5 speed or 6 speed auto transmission, since I’m not shifting anymore. Here are the specs for the 2012 Honda CR-V: 23/31/26 for the 2WD and 22/30/25 for the AWD (IMO – a pretty good sacrifice). My AWD version gives me over 28 mpg (combined) with ECON turned ON most of the time. My 2000 Civic was around 31 (combined). Now folks, is it really a gas guzzler? At 28 mpg combined, its pretty much like a car. It’s not a Prius, but pretty acceptable. The 2012 Honda CR-V sacrifices performance for fuel efficiency, so while your 0-60 may take you well over 10 seconds, your not breaking the bank at gas station. Again, in the Bay Area during peak hours you can’t do 60, so who cares? The trunk in my car was packed with my gym bag, tennis ball hopper, racquets, swim gear etc. that going to Costco was getting to be a hassle especially when my wife had thrown three 5 gallon water dispensers. I ended up loading the front and back seats. SUVs will naturally win here. The 2012 CR-V has a cool feature where you can completely fold the back seats by pulling a strap, in cases where you really need the room. There’s really enough room to comfortably sit people in the back seat. This is probably a Honda thing, but the seats are really comfortable. 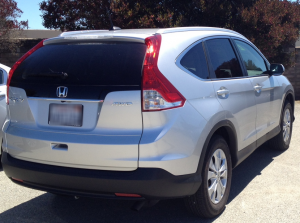 The 2012 CR-V feels and handles more like a car. The interiors on the EX-L w/ Nav are really luxurious and the redesign definitely makes it look very hip and sporty. It is not and does not look cheap! If you’re going up to snow country for some skiing, there are more 4WD options with SUVs than cars. You never know when you might need all the wheels and for 1 mpg drop on the 2012 CR-V, I thought it was a decent sacrifice. Depending on what you’re looking for this might be tricky, but I negotiated like crazy (a 4 week period) and got a good deal on the 2012 CR-V EX-L w/ Nav. I would say that you could get a fully loaded CR-V at around the same price as an Acura TSX Base, but you could get a Honda Civic for way less. I believe that this should by far the most important decision making factor. To sum up, smaller cars definitely win when it comes to fuel efficiency, parking, handling and cost. But with luxury cars you will lose out on fuel efficiency and cost. Depending on your choice of SUV or crossover you might be able to weigh in the benefits and compromise on lacking areas. For me, really a vehicle is a way to comfortably get to and back from work with occasional road trips rather than a serve as a status symbol. Although I went a little overboard with a top of the line CR-V, I really enjoy the added features and I think it’s a practical vehicle. TWO WEEKS IN HELL (available on NetFlix Streaming) is a fantastic documentary that takes candidates’ physical and mental fortitude to the limit. It is not Reality TV. This is a serious documentary that gets you intrigued right from the get go. Candidates start quitting from the Hour 1! The content is pretty graphic, but it’s the truth. The would-be Green Berets need to prove they can emerge victorious in uncharted hostile environments and in addition to being extremely innovative they must prove above all that they can follow instructions and will not risk their operations. They must demonstrate their sincerity in working with a team. The Special Forces and Selection (SFAS) will use all the latest technology and gadgets to observe the candidates over the two week period, and then evaluate if they have what it takes. I had no idea what Green Berets needed to go through until I watched the two series documentary. Just Amazing! Must watch! Does Facebook need to be worried? How does this affect LinkedIn’s Stock? Would Google+ be as successful as Facebook? Are the BRIC countries going to adopt Google+? It’s not Twitter and though it addresses some of Facebook’s Privacy issues and being available on the Android Market (soon to be on all Mobiles/Tablets if it has not already) , it’ll be very interesting to see how and if Facebook users will transition over to Google+ and what lies in its future. Oh, and what’s Microsoft’s plan now? I recently got a Kenwood DNX 6160 Bluetooth/Navigation system installed in my wife’s Toyota RAV4 and this is an initial review after using it for a few days. The Kenwood DNX 6160 costs about $800 and comes with Garmin Navigation (which has it’s own antenna) and Parrot Bluetooth (which comes with an external microphone). It plays DVDs, MP3z. Has an AUX input on the front, supports USB, iPod/iPhone. It is HD Radio and Satellite Radio ready, which means you will need to buy the Tuners and pay for Satellite Radio subscription. It also supports backup camera. I don’t think you can hack it and get to the Operating System, though I’ve seen some stereos support Windows. When is Android coming to an in-dash system? You could buy it from Crutchfield and attempt to install it, but IMO it’s better to have the folks at Fry’s or your local Best Buy insall it. Especially, if your car is new. After using it for a few days here are initial thoughts. Garmin Navigation is awesome. It even tells you the speed limit and your current speed. Bluetooth integration is flaky, but once paired with my Blackberry it works pretty well. The color of the lighting on the buttons can be changed to match the lighting on your car. CD or DVD can be loaded directly, without tilting. Boot up time is at least 10 seconds. Which means only 10 or more seconds after starting your car, will you hear the radio. At high speeds, the microphone sometimes picks up disturbance and the caller might not hear you clearly. iPod integration is not easy. I’ve been able to see the music but not play it. AM reception is terrible (but it’s probably a lose connection) and I’m taking it back to the installer to get it fixed. It’s supposed to use the car’s antenna. User interface is hard to use and most of it has to be done from the UI. I would have liked physical source select buttons on the side instead of having to do it through the UI. So far I see only 3 buttons Nav, Tel and Src along with a Volume knob. I would have liked the Seek to be a knob as well. Overall, its pretty nice for what it does and the plethora of devices it supports, but it’s still very expensive. Not to mention the other costs (dash-kit, harness etc.) of getting it set up in your car – you’re looking at $1200 easy. Earlier, I was too tempted to buy a Factory-Fit Chinese Navi/Bluetooth stereo from eBay and install it myself, but then I thought I’d take the safe route and go with a reputed brand. I drive a Honda Civic EX which is perfect for my urban-style commute (home, work, gym, errands, visiting friends etc.). My wife needed a new car after her Bimmer got “totaled” (some guy hit it from behind), so I started researching SUVs around $20K. She has pretty much the same commute as I do, but we also wanted to factor in some ski trips we would make to the Lake Tahoe area. We’ve been taking the Bay Area Ski Bus and doing day trips last few seasons which worked out great but another reason we refrained from driving was the lack of a 4WD or AWD vehicle. At least the idea was to not be stuck when there’s a whiteout. In addition to skiing, we also do a lot of indoor rock climbing at Planet Granite Sunnyvale and make a lot of trips to REI where the majority of the cars you see in the parking lot are Subarus. Great! Major pressure to be “cool”. Sounds similar to the Mac vs PC decision or what? The Subaru has this ultra-cool image of love-the-outdoors. The good thing about Subaru is that they only make AWD vehicles. Simple. With Toyota and Honda there are so many options and so many choices. Preferably have roof rails with cross bars to mount ski rack etc. …until I started test driving them! Choice 1: Subaru Forester – RULED OUT. The Subaru was extremely comfortable and the interior looked great. Easy to drive. But since it wasn’t the powerful XT, the acceleration 0-60 was painfully slow. Worse was the stopping 60-0. When it didn’t stop the way I’d expected, that image I had of the Subaru just crumbled. It was too scary and way too slow for Bay Area driving. Sorry climbers, snow junkies and REI fans! Can’t join the cool-club. I’ll just stick with Linux and Windows. Choice 2: Toyota RAV4 Limited V6 4WD – LOVED IT. I know it’s not a fair comparison – V6 vs I4s. But such a fun car to drive. Comfortable, looks good, sporty feel. Only drawback is the Limited doesn’t have Leather, No Moon-Roof either. You have to pay more for those “features”. What the @#$%? I still don’t know what the Limited offers. My wife seems to like the smart key system. As long as the keys are in your pocket you don’t need to touch they keys (ever!). Choice 3: Honda CR-V 4WD EX – LIKED IT. It just wasn’t as powerful as the V6 RAV4 but very close even being a 4 cylinder. Very comfortable, spacious etc. I really liked it, but it seemed pricey. The optional accessories like roof rack and cross bars etc. would quickly add up. It would be a lot harder to stay under budget. Next step was car hunting and trying to negotiate deals. The problem buying a relatively new Subaru Forester is that nobody is selling them! It has such a niche clientele. Only the dealers carry them and they have high mileage on them. Now, I have been ripped off by a car dealer once already and I wasn’t going to fall into that trap again, so I was cautious when negotiating Subaru deals. Since the Subaru Forester was RULED OUT already, only an exceptional deal – $17K (Out The Door) would have made me buy it. I found a couple of Honda CR-Vs on CraigsList, but wifey didn’t like the colors. 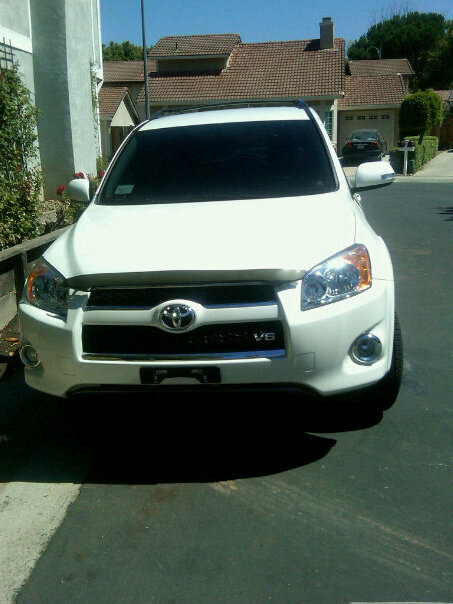 Finally we saw this White 2009 Toyota RAV4 Limited V6 4WD with only 4500 miles on it but it was in Lodi, CA (two and a half hours away) on the way to Lake Tahoe. So I wrote to the owner and a couple of calls later, we bought it the following weekend! This one even has the 3rd row seat which is not the most comfortable, but hey, I’m not going to climb in there – so who cares? =) This one even has the new car smell. I personally think that all these SUVs are really great but it all boils down to what you really need and what price you’re willing to pay. If your requirements are similar to mine, then I believe you should be able to satisfy most of them and still strike a deal for under $20K. There are lot of other websites like Edmunds etc. (even YouTube) that will provide more helpful information and tech specs for your research but IMO the RAV4 V6 4WD will not disappoint! The RAV4 has been very good so far. I need to take it up the mountains and drive it in whiteout conditions to see how it performs but the next project is finding a good in dash Navi/BlueTooth system. Just installed Kenwood DNX 6160… Stay tuned for the review! Made 38 queries to database.